Today I would like to help promote a few worthy resources for energy healers. The first is my Chios teacher, Connie Dohan's website, http://www.amidangels.com/. She is now, (besides teaching, offering readings, doing energy healing, and attunements), selling beautiful chakra jewelry. 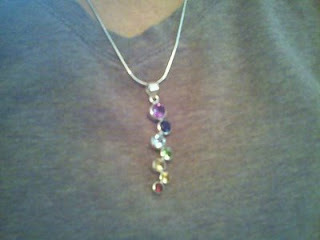 To the left of this text, please check out my necklace from Connie! I love the way the colors spread on my otherwise plain brown shirt! Radiant! I've received plenty of compliments and questions from those who have seen me wearing it, and I've had the opportunity to talk about chakras and Reiki. Love it! I also want to plug her website because next week, Connie is having a special on the chakra jewelry she is offering and an open house too, for those lucky enough to be in the Columbus, OH area on Sat., Nov. 1st. Connie is channeling readings for those who can make it that day. The jewelry alone is well worth a visit to the site and her place if you can make it. Secondly, I simply love this website: www.myinnerworld.com . I could spend hours exploring it if I had hours to do that, I mean. But each time I go there, there's something nice to see or click on. It's really quite beautifully put together and worth a look. Third, I'd like to introduce all interested to Sarah Weiss. She's a medical intuitive, and all around amazing spiritual person. She has done two readings for me, over the phone, and every single thing she found has been spot-on exactly right and extremely specific. The energy rushes I've felt during the sessions have been far more profound and powerful than any Reiki session (and you all know how passionate I am about Reiki!) and she is simply the real thing. Her website offers free meditation mp3s and plenty of advice and guidance besides. She teaches classes and offers many types of supportive help. Sarah's website is www.spirithealonline.com. There is much to learn from Sarah. I'm back from 36 hours at Cuyahoga Valley Environmental Education Center with 15 wonderful and spiritual Reiki people. We shared Reiki treatments with each other - (I realized I haven't had a full hands-on Reiki treatment since February at my Reiki Master class!) - talked a lot about how we came to Reiki, reiki-ed trees, meditated, participated in the global water blessing this morning, and a most wonderful treat is that the leader of our retreat, Carol Spears, played therapeutic harp for us. She even brought some crystal bowls which she incorporated into the music beautifully. It was very uplifiting. (Click on Carol's name for her website with her harp music, crystal bowls, and more.) Carol attuned one member of the retreat to Reiki 1 on the retreat, and he immediately channeled very strong Reiki. That was especially moving. I'm feeling quite relaxed, inspired and balanced. I'm inspired to grow the awareness of Reiki and am thinking of approaching the principal of my kids' school about doing a Reiki information session for parents. I think if the parents were interested in being attuned to Reiki, maybe they would accept teachers being attuned to Reiki, and so on. I think that educating the parents would be a good place to start. This week my kids are off school Tuesday & Wednesday, so things are going to be busy around here. I have to catch up on work now! Tomorrow morning through Sunday afternoon I will be away from my computer (gasp!) in a nature reserve with 14 Reiki practitioners and Reiki Masters, learning, sharing Reiki with each other, and connecting with nature. Woo-hoo, I am so excited! I'll post on Sunday night to share my experiences and the wonderful contacts that I'm sure I'll be making with other Reiki people. This could be another step in my journey, and I am soooo ready! This morning I had an interesting experience. I was typing away at my computer, trying to get some work done while I could when I started to feel tingly - as if I was receiving Reiki. I had a quick flash of my friend, whom I had attuned to Usui Reiki level 2. So before stopping to think, I shot her off a quick email telling her the time and asking if she had just been sending me Reiki. A couple hours later she replied a surprised "yes" answer. This is the first time I've been able to notice Reiki without knowing it was coming, and also intuit its source. Today my husband and I discovered to our dismay that a large frame around one of our back room windows is rotting out. We called a few window companies to get estimates and left messages, worrying about the cost. I left and took the kids to the playground. We had just gotten home from the playground when a little puppy with a collar came wandering into our yard. Seeing no owner about, I coaxed the puppy to come to me, and called the phone number on his collar. I left a message with my phone number and a few minutes later a thankful person called and was on the way to get the dog. When he came, we found out he is a handy man who moved a block away recently and he could replace and fix our window. He called us later with an estimate. I think we'll hire him. Nice. It seemed as if the universe just lined up right today. I want to show you a new blog I like. I added the feed to my right hand column, but please check it out. It's excellent - informative, thought provoking, and relevant to all things Reiki. I'll be taking the Reiki 30 Day Challenge probably starting next week. Here it is: http://reiki.whatitallbelike.com/ . Funny name, but way impressive. Check it out. I'm so excited because next weekend I'm going on a Reiki Retreat!!!! From Saturday morning until 2 pm on Sunday, I'll be in a beautiful environmental education retreat center, staying in a beautiful wildlife reserve, and sleeping in nice dorm-type rooms, sharing Reiki experiences, nature connection, and Reiki treatments with 14 Reiki people. The immersion and connecting with other Reiki people will be amazing - I know it! I'm so excited already! I'll be getting more details about the schedule in a few days. I'll keep you posted. Archangel Zadkiel who serves on the Seventh or Violet Ray which is the Way of Freedom. The person with this attunement can call on different archangels for different needs such as confidence, strength, healing, clarity, peace and truth. I called in help last night to give me confidence for today, when I had to lead children's services for Yom Kippur and run some activities which followed. I did feel that I had an energetic connection and will continue to work with this energy in the hopes of strengthening my connection to these higher beings. Things went well today, by the way. Last night I went to sleep playing the astral projection mp3 again. I have to say that I felt my inner self vibrating very strongly as I listened to it. I think there is something to this, but I need to keep working with it to see what will happen. It was definately a stronger vibration than last time. So it's all a process, as I've been told, one which is leading somewhere and will one day all come together. Happy New Year to my fellow members of the Tribe. I've been interested in binaurals and astral projection lately. I downloaded an mp3 of music with binaurals which are supposed to help one astral project during meditation. I got it from a funky site called unexplainable.net . So I tried it. Twice so far. The first time, toward the end of the 30 minute meditation music I felt like I was vibrating all over. It was very interesting. It kinda felt like that moment before you fall asleep. But I wasn't asleep. Then it ended. Last night, I played it while settling into bed. I was very tired. I remember listening to the sounds (bells, water, soft music) and the next thing I know I woke up this morning. The music actually comes with a money back guarantee, and the testimonials have someone's account of it working for him on the fourth try. The money back guarantee is good for 8 weeks so I'm going to keep trying and I'll keep you posted. In Tachyon and KR news, I've been blessed lately to have done attunements for people in Thailand and Switzerland - with very effective results. I always am impressed by the way the energy works over any distance and time. The consistency of the results is truly beautiful. Peace and a happy New Year to all my fellow tribe members!